Sepsis is a condition when the body's immune system - which is meant to fight against disease and infection - starts to attack the body's own organs. 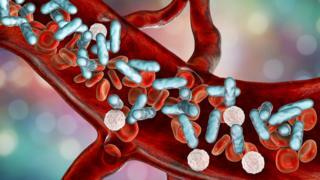 The NHS explains: "Sepsis can be triggered by an infection in any part of the body. The most common sites of infection leading to sepsis are the lungs, urinary tract, tummy (abdomen) and pelvis." It can be difficult to diagnose as the symptoms can at first appear to be flu, gastroenteritis or a chest infection. This is a problem because it's really important to diagnose sepsis as early as possible and for the patient to start taking antibiotics. Now, a new test could help to tackle this issue. What is the new sepsis test? 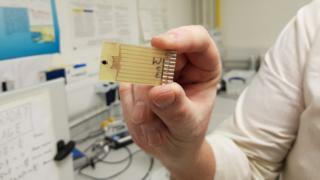 A new test for quicker diagnosis of sepsis has been developed by researchers at the University of Strathclyde. A device used in the new low-cost test examines the patient's blood and is able to give a result in two-and-a-half minutes. At the moment, it can be tricky to diagnose the condition, but the new test would enable doctors and nurses to quickly test for the condition themselves - at a patient's bedside in hospital, in A&E departments or at doctors' surgeries, for example. Not only that, but at the moment blood tests to work out exactly the right antibiotic for the patient can take three days, so this new test could prove revolutionary, as it will provide this information much quicker. It can also be used to monitor sepsis levels, so doctors can work out the right treatment for those who are ill. Researchers say it is hoped that it will be possible to use this test for everyday diagnoses in three to five years. How does the new sepsis test work? The new device tests the blood to see if a protein called interleukin-6 (IL-6) is present. Dr Damion Corrigan, who was part of the team that developed the new test, said that IL-6 is one of the best markers of the condition. It will be able to quickly diagnose the condition and, should this be positive, recommend the right antibiotic for patients to take. Co-author of the project Dr David Alcorn explains: "The implications for this are massive, and the ability to give the right antibiotic at the right time to the right patient is extraordinary.